Interested in the issue of fracking? Voice of Harlem about this very topic. How the moratorium actually helps gas companies and lease holders. why all those emails you get about fracking do not mention it. Learn more on this issue at this important website. Youth End of Summer Jam! Come help us celebrate all the great work our Summer Youth Employment Program members have done in Brook Park, the Bronx and city-wide. All teams, programs, youth and adults are welcome! Bar B Q, with food grown in brook park too! Presentations by youth welcome on what they did this summer. And your ideas are welcome! Please share this with whomever you think may be interested. And Bronx Green-Up/The New York Botanical Garden. Invites you to come see what our kids are growing! The day includes a healthy lunch, a lesson in agro-tourism and entertainment. Tours will pick-up at Visitor’s Center in Midtown: Arrival time 9:00 AM at the New York Visitors and Convention Bureau, located on 810 7th Avenue (and 52nd Street), Manhattan. 10:00 AM sharp departure from Midtown Manhattan, 3:00 PM return. Tickets are $20; RSVP required. Pedal to Paddle to Bar B Q! 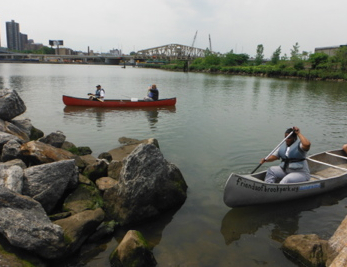 Bike tour of our waterfront ends on Randall’s Island with canoe paddling introduction tour. Join South Bronx Unite! for a FREE unique tour of the South Bronx and Randall’s Is-land. The ride will promote environmental awareness through site visits to the water-front, community gardens, public artwork and historic places, as well as power plants and waste transfer facilities that pollute our rivers’ shores. We will see the proposed site for Fresh Direct that we are working to stop!